Led Zeppelin is one of the greatest bands in rock history. This pretty much cannot be disputed, although I am occasionally struck by people’s ignorance of this band’s contributions to modern music (I’m mainly thinking of you, Drunken Black Sabbath Fan in Hong Kong). Yet there are people — folks who know music, and aren’t just listening to Coldplay on repeat because they can’t be bothered — who dislike Led Zeppelin for their inherent flashiness, or because their music is “all about showing off”. Now that is just mind-boggling to me. Um, what? Do you mean they should be more mediocre? Oh, OK. Please, guys, stop being excellent. Slow your roll, William Shakespeare. Just make your point and move on. Oh, and you, Pavarotti, please pipe down. You are making the rest of us look bad. What people seem to want today, what would appear to mark you out as One of Us, is subtlety and restraint, a testing of your willingness to throw a neutral-color-washed, Fair Trade organic cotton wet blanket over your own exuberances, your own rages — all in the name of great good taste. Flying in the face of all that Banana Republic-mandated conformity is this music: Robert Plant’s banshee wail, John Bonham’s Godzilla stomp, Jimmy Page’s ominously circling riffs, John Paul Jones’s … something. Certainly, Thai food can be subtle and restrained — that is, after all, the point of “royal Thai cuisine”: beautifully-prepared Thai dishes with all the bones and pits taken out, made for a “harmonious” palate that refuses to skew to any extreme in flavor. I have never been a fan of this cooking philosophy, even though this balance is what most Thai cooks aspire towards: the fine point between sweet, salty, sour, spicy, and bitter. Instead, I want to be hit over the head with something (this is a metaphor). Yong, who has cooked for my husband’s aunt Tongsri since she was 13 (she is now 57), is basically a Bonzo with the mortar and pestle. Arduously put-together curry pastes are just a thing of the moment for this woman, something to do in her free time before she prepares real dinner for the family. 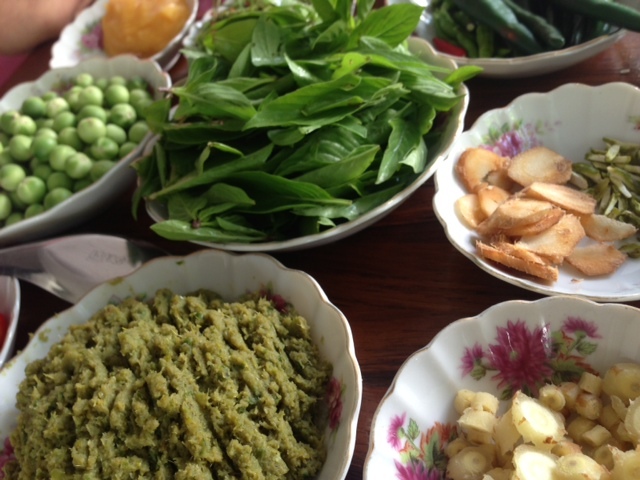 One of her best-known specialties is gaeng kiew waan, or green curry, which she almost always prepares with beef. The result: unctuous, sweet and salty, but full of rattle-you-around-the-throat flavor, especially with the handful of bird’s eye chilies she flings onto the curry as garnish. The next day is even better: the meat has almost disintegrated and the chilies have mellowed and soaked up all the soup, gushing coconut milk as you bite into them. Do not omit the bird’s eye chilies! Making this curry is hard. I will tell you up front now that I am not the cooking equivalent of Bonzo, or Keith Moon, or even the dude who played at the last wedding you attended. 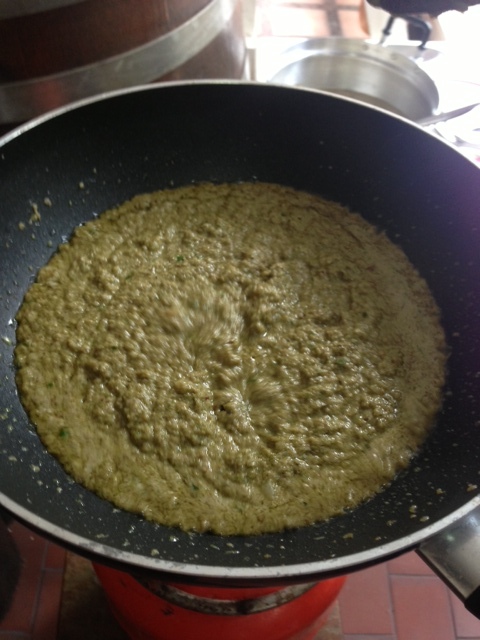 So I will be making do with a commercially-made green curry paste base when I try this recipe without Yong. But if you feel up to it and can source these ingredients (the addition of grachai, or wild ginger, is integral to this recipe), feel free to rock on. 1. Stew beef in coconut milk “tail” for one hour. 2. For paste, pound galangal and kaffir lime rind with salt. 3. Add lemongrass to mortar. 4. Add chilies, but can omit bird’s eye chilies if you don’t want it too hot. 5. Add garlic, shallots and wild ginger. 7. Take finished paste and heat in pan with a couple of ladlefuls of coconut milk that have been used to stew the beef. 8. Add spice mix (dok jan, look jan, cumin and coriander seeds). 10. Add a few more ladlefuls of coconut milk until you get the consistency you want. 11. Take paste off heat. 12. Add meat and coconut milk “head”. 14. Add basil and baby eggplants, if using. 15. Garnish with chilies and kaffir lime leaves. 16. Eat with roti (like its Indian namesake, but flakier), kanom jeen (fermented rice noodles) and, if you like, pickled ginger. This ‘flakier Indian roti’ you mention is the LACCHAA PARATHAA of northern India or the more specialized Kerala ‘parotta’. The first is easier to make for the home cook and less greasy than the frozen ‘roti prata’ [sic] on sale. Thanks! I learned something new today! Dok jan is given as “mace”, luk jan as “nutmeg” : does this sound right to you? Sometimes cloves are added for duck green curry, so perhaps these stronger aromatics are used for the stronger taste of beef? Thank you — it does sound right! I will be using those terms from now on! Hey! I enjoyed reading your blog when I was doing some research for a trip to Thailand last December and have found my way back now that I’ve started cooking Thai dishes here in NYC. 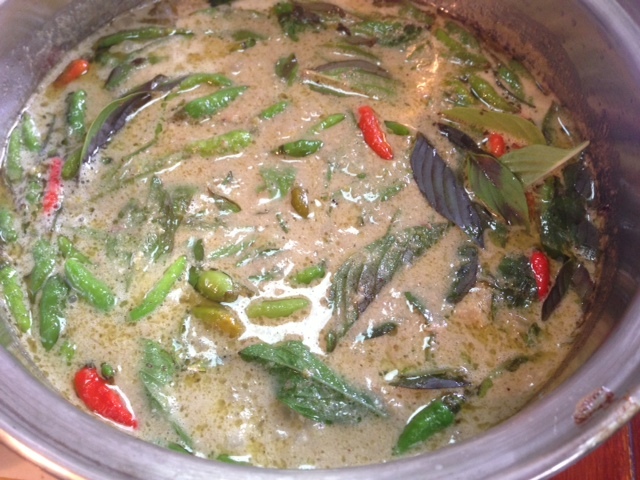 I am going to try to make your auntie’s green curry recipe. Googling around I’ve learned that look jan and dok jan are mace and nutmeg- two spices from the same fruit. I’ll let you know how it goes. Pretty sure I can track down fresh versions of nearly ingredient here….and I will most definitely rock some Led Zep when I cook. That’s awesome — thanks for telling me. Of course I should have googled. Good luck with the recipe, let me know how it goes!